Pittsburgh’s St. Patrick’s Day parade dates back to 1869. For a complete history of the parade, click here. The Parade will begin at the Greyhound Bus Station at the intersection of Liberty Avenue and 11 th Street. Staging will take place from the bus station and away from Downtown to 26 th Street. The parade will proceed from the intersection of Liberty and 11 th Streets to Grant Street to the Boulevard of the Allies, where it will turn right. Proceed on the Boulevard of the Allies to the Reviewing Stand at Stanwix Street, then disburse at Commonwealth Place. 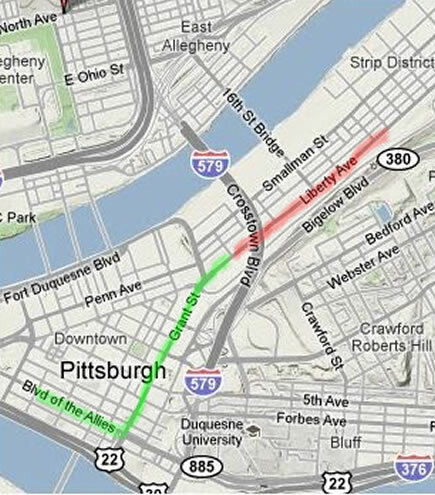 View a larger printable PDF version PDf the Pittsburgh St. Patrick's Day Parade Route Map here. many other groups representing several Irish heritage and other ethnic heritage organizations. spectators on a warm, sunny day. Mass will precede the parade at 8 a.m. at St. Patrick’s Church in the Strip District. And The Family-friendly Parade Fest in Market Square! Location: Downtown at 10 a.m.-1 p.m.
little lads and lasses will be able to have their faces painted for the holiday!